It’s amazing to think that Google recently celebrated their 20th birthday. Those of us who started our careers before the behemoth’s existence remember a time when search was kind of a mess. We relied on the likes of Yahoo!, Alta Vista, Lycos and a host of others. It could be difficult to find just what you were looking for. Part of that was due technological limitations of the time. But the web was also quite a bit smaller then. When Google first hit the scene, it was like discovering an oasis in the desert. The starkly-minimal home page quickly led us to discover search results that were more relevant than before (at least, they seemed that way). This was truly a new and exciting tool. For a very short while, it even seemed like a secret weapon that only the cool kids knew about. Since those early days, the company (which is now a division of its parent, Alphabet) has expanded well beyond what any of us could have imagined. Sure, it’s still on our computer screens. But it’s also in our pockets, in our home appliances and, if you ask some people, all up in our business. As a web designer, I’d consider my relationship with Google to be on-again, off-again. I kind of love them but sometimes I don’t. There are simply too many mixed feelings in me right now. Let me explain. On one hand, the company provides services that have revolutionized what we can do with a website. Everything from typography to analytics has empowered solo entrepreneurs and big companies alike. 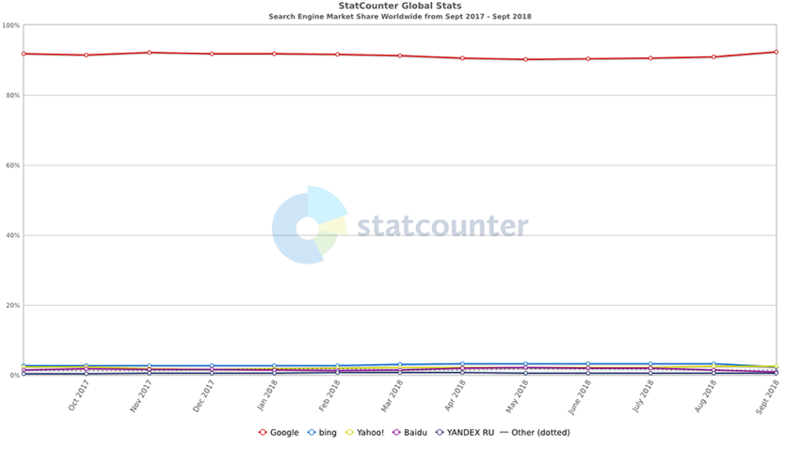 When you recount every Google-based service that is in heavy use out there (good luck remembering them all), it’s hard to imagine the web without them. While other companies have come along and created competitive products, Google was among the first out there pushing the envelope. They may have started out as a search engine, but quickly evolved into so much more. As a result, they have moved the web forward and dragged the rest of us along with them. It’s amazing that so much innovation has come from a single place. When was the last time you heard anyone talk about optimizing their website for a search engine other than Google? With a market share over 92%, they have a complete stranglehold in this sector. That leads to a mad scramble among SEO specialists whenever there is a change to the company’s algorithm. They (sort-of) tell us the rules of the game and we’re obliged to follow. Once we’ve figured things out, the game changes again. It’s a vicious cycle that affects us all. In a bid to become more useful, relevant bits of microdata are harvested from websites and displayed within Google’s search results. Examples of this include ratings, reviews and reference information. This is incredibly helpful when you’re searching for something. But it could also lead to less search traffic for websites. By providing this information within the search engine results page (SERP), users have less incentive to click through and explore. Google’s AMP project aims to make the mobile web faster and easier to read. While that’s certainly a noble cause, there’s also some aspects of the technology that are controversial. For instance, Google has given news sites using AMP special treatment in search results over those that don’t. Much like the microdata mentioned above, it’s convenient for users. But it’s also arbitrarily dictating what we see based on adoption of their (albeit open-sourced) platform, rather than on relevance alone. The overall gist is that websites that do as Google says are treated better than those who don’t play along. Google’s ascension to the top is a classic Silicon Valley success story. A simple idea with a high-tech solution that turns the world on its head. What Apple and Microsoft did for the personal computer, Google has done for the web. The difference is that, if we want to succeed on the web, we are essentially forced into following their dictum. In contrast, even at Microsoft’s peak of influence, we still had the option to choose a Mac. Therein lies a major question about Google’s role in the web’s future. How much influence should one company have? The web in and of itself is not a consumer product. It’s an open medium for communication, sharing information and conducting commerce. It’s a complicated question and one that I’m nowhere near qualified to answer. But to those of us whose careers depend on the web, a resolution can’t come soon enough.